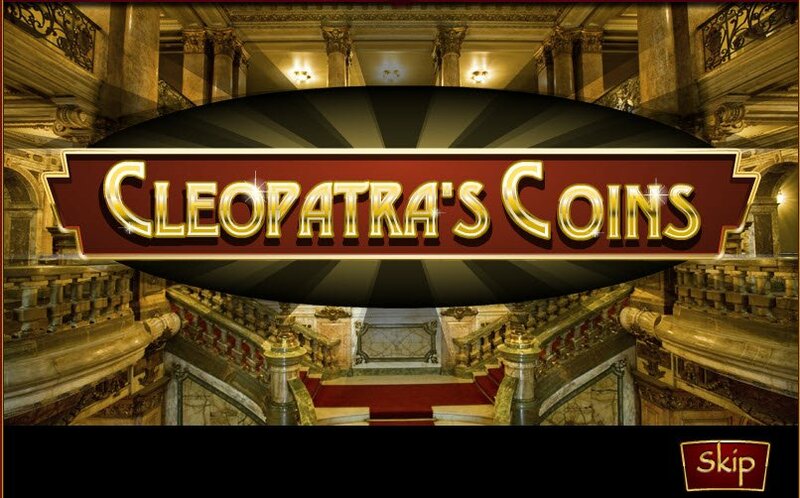 Cleopatras Coins slot jackpot is on offer at a nice 5,000 coins for you to play with. The graphics aren’t up to scratch but, there are some interesting ideas and cute animations in this 5 reel, 15 payline slot game taking us back to ancient Egypt. This Egyptian themed slot tells a story of the pyramids, a different time when men used to travel around by boat making their foreboding presences known on their visits to Queen Cleopatra and her many, many coins. The subtle Egyptian style music quietly increases the whole atmosphere and reminds me of snakes slithering around and, encourages me to a whole world of wonders about to open up to win a hefty 5,000 Cleopatras Coins Slot Jackpot! After all, Cleopatra WAS the last Pharaoh so she must have been stashing the cash somewhere! The sounds that pop up as you spin your reels are mysterious and make me think of bandaged mummies. The opening introduction skit is very cartoonish in style and, as we meet the sandaled men visiting Cleopatra, the graphics manage to capture the expertly made up look on the lady's face. 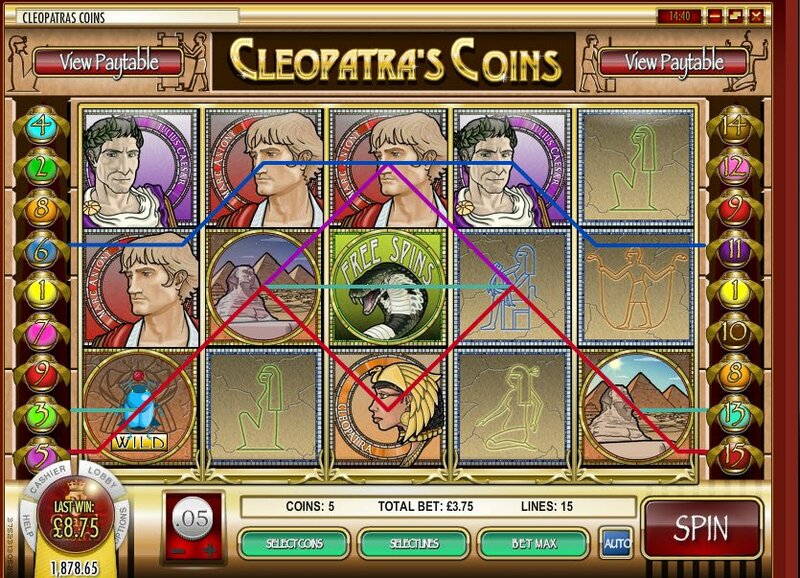 There are some colourful, faded graphic hieroglyphics serving as Cleopatras Coins slot symbols, including a gold coin itself that will lead you to those Cleopatras Coins slot bonus rounds. 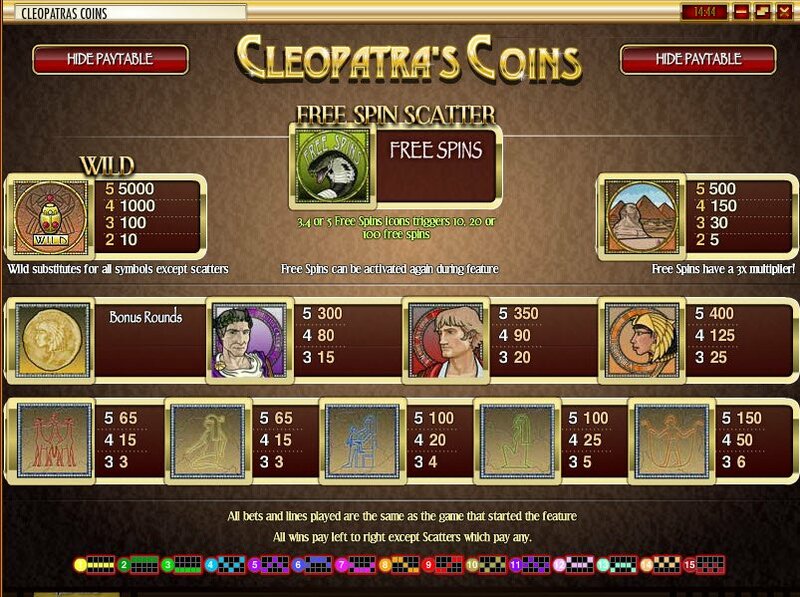 Scarabs and Sphinx symbols are also there for wild symbols and plenty of Cleopatras Coins free spins. The dude with snakes symbol looks more like a kid with a skipping rope and, the man standing on camels that have lost their humps looks like he is about to be dragged apart when they realise their tails are tied together. Still they do brighten up what would otherwise be a dusty cave or stone wall. The animation you get when you spin for the free spins is cute and, reminds us not to take the lids off of containers containing snakes! The sounds that pop up as you spin your reels are mysterious and make me think of bandaged mummies. Ah, the elusive bonus round. It was rather hard for me to spin enough cold coins to get me in to see what all the fuss was about and, I even considered hiring Rumplestiltskin to help me weave the gold coins that would open the doors to me in Cleopatras Coins slot bonus round. We enter Cleopatras secret chamber and smash up her urns to see what treasures lie within.